The disadvantage of using Android is the fact that it is not iOS. Which means you cannot tune up your Android device with the help of a software similar to iTunes. However, things are changing! A new ‘All in one Android Smartphone PC Manager’ is making its way into the market which is Mobogenie. It is easy! 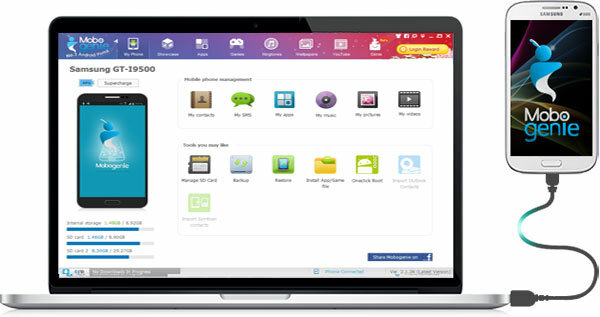 All you have to do is download the Mobogenie market app and smartphone PC Manager. Once you download and install it into your PC or laptop, connect your smartphone android device to your PC or laptop using the USB port with the help of a USB cable. By doing so you can successfully enable debugging mode! Once the software identifies your smartphone device it will set the device for syncing. While the mobile phone company’s original suite provides more or less the similar features that the software is providing, the Mobogenie Market has however bestowed upon its product with some more exciting features! So much to expect from Mobogenie!! It isn’t just amazing, Mobogenie Market is truly spectacular! The software lets you not only download but also update various applications directly from the suite. Downloading and updating apps on your PC or laptop is way more convinient and considerably faster since you’d be using high speed internet on your computer when compared to the 2G data pack that you use for your smartphone. However, you can only download the Free Applications with the help of Mobogenie for PC. So no one really cares about ringtones these days? Now they will! Mobogenie Market proved its excellence yet again, by letting its users set ringtone directly from the suite. That’s not all, you can also set alarm and other notification alerts of your choice with the help of Mobogenie. The only people conscious about the wallpaper on their smartphones are the teenagers. But Mobogenie Market is keen to get back the old trends. With the help of the software, you can change your smartphones wallpaper to whatever you like instantly. Just when you think that Mobogenie has nothing more to offer, the software tends to surprise you. With a built in YouTube Downloader, Mobogenie Market is winning many hearts. All you have to do is, browse through the videos by clicking on the YouTube tab which will lead you to a search bar. After you have selected the video that you wish to download all you have to do is click on the download. Downloading a YouTube video has never been so easy! Contacts: Ever heard of maintaining your contacts through a software as powerful as Mobogenie? Sure you haven’t! The Mobogenie Market, lets you manage your contacts but at the speed of a tortoise! SMS: Maintaining a clean Inbox, is not only a good habit but for some of us a life saver! With this specific feature of Mobogenie, you can manage your SMS which comes very much in handy. 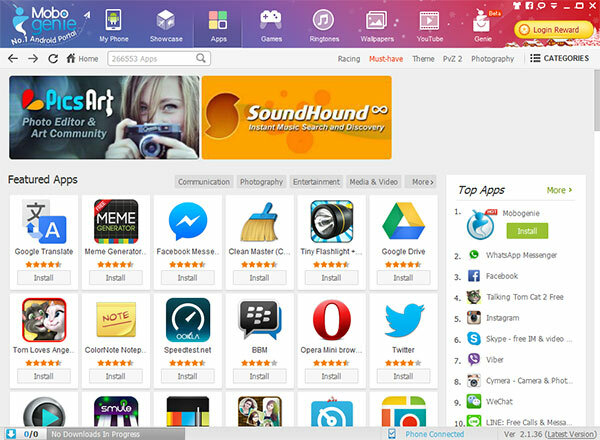 Multimedia: The reason why most of us would actually download this software, is its capability to manage all the pictures, music and videos on your smartphone device. Mobogenie is certainly a must have for all the Android smartphone users! The software offers so many features. In order to compete with its competitors the company has spread the word that soon we will be exposed to the same old software with exciting new features! While most of the busy crowd, may not really like this new software, people with great enthusiasm and a lot of time at disposal would definitely like Mobogenie. Although it isn’t very fast, it does provide certain features to its customers, which a part of the crowd may find rather attractive and interesting. With the world moving at the speed of light, no one really has enough free time to spend on organizing their Android smartphones. Having said that, Mobogenie is one of the best software which providing some highly attractive new features to its customers. Mobogenie market is one of the best alternative available to Android market. There is too many new and interesting things that Mobogenie offers to its customers. However, we hope that the Mobogenie Market would come up with some more quick and exclusive features, that will make it most popular amongst the busy Android users.